Course includes 5 classes and 5 coaching calls. Classes are weekly and are 60-90 minutes in length at a set time and location. Coaching calls are weekly for 30 minutes; these are scheduled during first class. Each class covers a specific life area –HEART, HEAD, HANDS, HEALTH, HOME– and how to bring your True Self into these areas. You will need a journal. 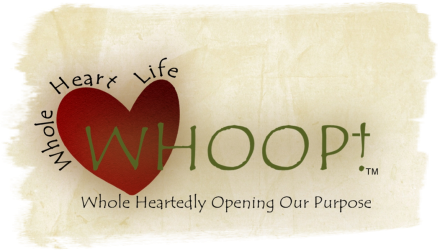 WHOOP Groups are for “graduates” of these classes who want to continue the journey to a more Wholehearted, spirit led life. Speaker: The information from WHOOP Classes can be transformed into an all day workshop or overnight retreat. Barbara also has a list of short presentations for 2 hour gatherings. If you would like more information fill out this form. HEART – Do you trust yourself? How often do you follow your inner voice/spirit? Do you feel like you are living life or just in it? Do you know your passions, gifts, and purpose? Do you know who you are? HANDS – Are you content with the work you do at home, the work you do for yourself and with others? Do things from your past direct your attitudes and decisions about your actions now? Are you filled with future fears or worries? HEAD – How is your thinking? Is it being productive for you? Would you say your perceptions of others are loving, compassionate, non-judging? How are you perceiving yourself? Do you know how to receive a “miracle”? HEALTH – Do you have a good relationship with your body? Do you treat it with care and reverence? HOME – Is your living environment reflective of your true self/spirit? Is it your HAVEN? *A sense that you are missing something…a gnawing in yourself that there has to more of something…like peace, joy, love. *A connection with other women who want to be authentic and wholehearted. *A life change: marriage, children, empty nest, divorce, death of spouse, etc. Barbara’s WHOOP class was a blessing to me. The weekly coaching calls – a concept with which I was unfamiliar and uncomfortable – proved to be one of the best parts of the class. After my first call, I had a totally unexpected sense of joy, and I walked around with a big smile on my face for the rest of the day. In both the group classes and the coaching calls, Barb constantly came back to the idea of identifying and getting rid of the things that hinder us from listening to the Holy Spirit within us. She humbly and effectively helped all of us learn to hear and do what the Holy Spirit was already telling us. For me, that meant clarifying my purpose and passions, and making choices in accordance with them. Rather than feeling selfish and guilty, I now see that this is the most loving thing I can do for myself, and by extension, for others. I have more joy and energy to give to my family, friends, and even my clients. Living with a loving heart is changing the way I see and interpret the world around me, and how I react to it. Here are some things that have occurred in my life since attending the WHOOP Class: my first massage in my entire life (and I’m over 50), I have discerned part of my purpose in life and am not fearful of trying it, and I have worn a color I always wanted to wear but was told it was not for me–I received compliments. In summary, I am listening to my heart/spirit now! I have a greater, more positive understanding of who I am in my heart and learning to apply it. I’m so glad I was invited to the WHOOP class. It came at a great time for me. For some years I had felt as though I were riding on top of a wave, just dealing with situations and life as it came along. This class gave me the opportunity to stop and look at who God actually designed me to be and what I am to be doing. I realize I need to be as close to “whole” as possible. Out of this exercise I will be better able to help others and use my life as a positive influence. My new mantra is now “A Foundation of Peace.” I needed to remember that loving myself is choosing preferable behavior. I want to continually be aware of this. I really learned that putting the past where it belongs (in the past!) and getting rid of bitterness and heartache means I can create my own tomorrow, following God’s leading. How exciting! WHOOP! I recommend the class to anyone. Barb is a terrific leader and coach.